When you think of San Francisco, it is almost impossible not to think of sourdough bread. Sourdough bread has been a staple of San Franciscans since the days of the Gold Rush. 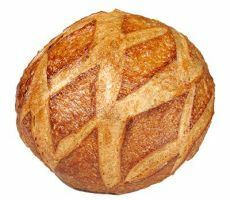 Sourdough bread is a variation of French bread with a crispy crust and a hearty, tangy flavor that makes your mouth water. The distinctive flavor is due to the fermentation of the dough by natural yeasts and acid-producing bacteria in the leavening. Making sourdough bread at home requires knowledge, patience, and the desire to experiment because you may not get the results that you want the first time. If you want quick bread, forget about sourdough. 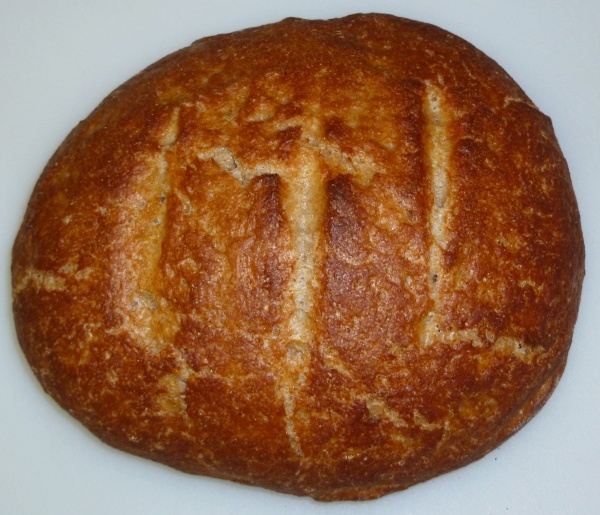 The recipe for sourdough bread is not that different from ordinary bread, but the rise time for the dough is longer, the first stage of the baking cycle requires the generation of steam to create a crispy crust, and the initial culture of the leavening or sourdough starter may require at least one week of preparation. If this does not intimidate you, this page will teach you how to make sourdough bread from scratch. 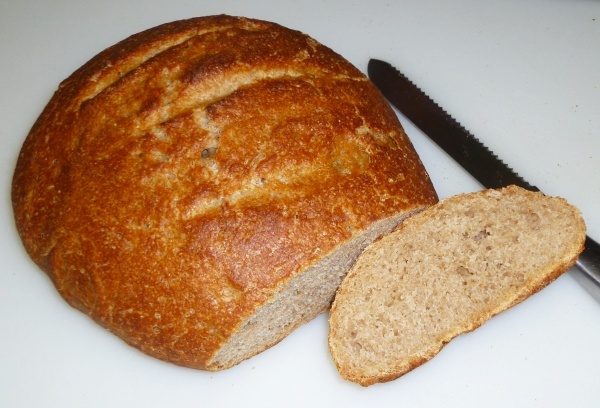 If you are interested in making Ordinary Bread, Click Here. The gas-producing organism in ordinary baker's yeast is Saccharomyces cerevisiae. The reason why many recipes for bread require sugar is because baker's yeast ferments mainly simple sugars. 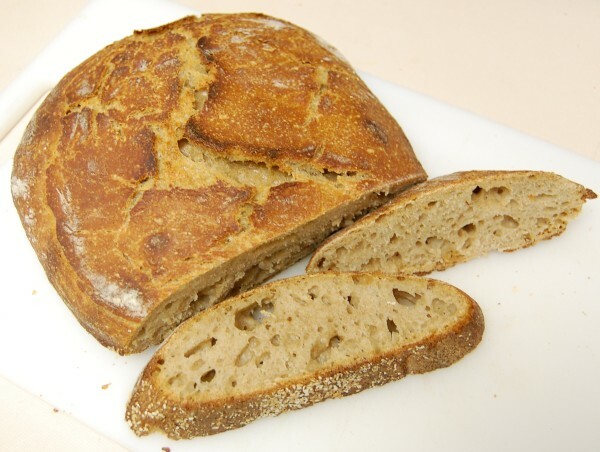 By contrast, sourdough starters, also called natural leaven, levain, or pre-ferments, consist of a symbiotic culture of Lactobacillus sanfranciscensis and yeasts such as Candida milleri or Saccharomyces exiguus. These yeasts don't need sugar because they use the complex carbohydrates (pentosans) in the flour to produce gas, and the lactobacillus produces the acid environment needed by the yeasts. The most frustrating aspect of making sourdough bread from scratch is trying to get a good sourdough starter or "mother sponge". Many recipes call for just mixing equal parts of flour and water, throwing away half of the mixture, and adding more flour and water. The process is repeated for many days until a stable colony of gas-producing organisms can be obtained. Unfortunately, many batches produced by this method have to be discarded because they become contaminated with undesirable foul-smelling organisms such as Leuconostoc species which are associated with spoilage of fruits, vegetables, and grains. A reliable method for creating a sourdough starter was developed by Debra Wink by systematically testing the acidity and temperature conditions needed to promote the growth of the desirable microorganisms. There are three important requirements: 1) use whole grain flour, 2) acidify the flour medium, and 3) maintain the temperature at approximately 75°F (24°C). Whole rye or wheat flour is recommended because the desired yeasts normally inhabit the cereal hulls which are discarded to make refined flour. 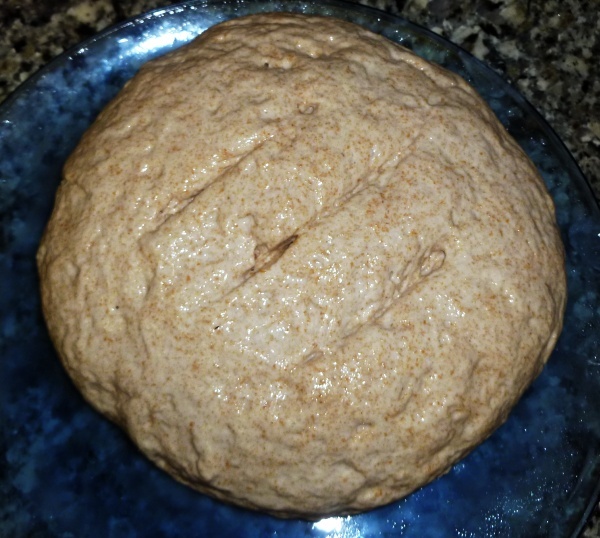 The required degree of acidification of the starter is provided by using apple cider or unsweetened pineapple juice instead of water to get the culture started. The warm room temperature speeds up the process. Day 1: Mix 2 Tbsp whole grain flour and 2 Tbsp unsweetened pineapple juice. Day 2: Add 2 Tbsp whole grain flour and 2 Tbsp unsweetened pineapple juice. Day 3: Add 2 Tbsp whole grain flour and 2 Tbsp unsweetened pineapple juice. By day 4 the mixture should bubble, expand, and smell yeasty. Starting from Day 4, it is necessary to discard some starter to keep the proportion of fresh flour high enough to support the growth of the yeast while keeping the total volume of starter manageable. At each feeding, the weight of starter must be less than or equal to the combined weight of the new flour and water. If the starter is kept underfed when the yeast is growing, the starter will become overly acidic and will not raise dough well. Once you have a good starter, you can keep it loosely covered in the refrigerator and feed it once per week using the procedure for Day 4. Do not use tight-fitting lids for the container with the starter mixture because the gas pressure can build up and break the container. Refeed the starter for two days at room temperature prior to making bread. Mix the dry ingredients in a large bowl. Dissolve the starter in the water. It is important to use non-chlorinated water because chlorine will kill the gas-generating yeast and bacteria in the starter. Pour the water on the flour mixture while stirring. Shape the dough into a ball and cover the bowl with plastic. If your starter is very fluid, you may need to add 1/4 cup additional flour to obtain a dough that has a moist and firm consistency. The porosity of the bread depends on the amount of water in the dough. Wet doughs produce breads with big holes. Leave the covered bowl at room temperature (75°F, 24°C) for approximately 18 hours. During this time the dough will approximately double in size. Sprinkle some flour on a large cutting board. Empty the dough from the bowl unto the board and spread the dough gently so that it can be folded in thirds and then folded once more to form a ball. Cover with plastic and let the dough rest for 15 minutes. Using slightly less water (approximately 1 1/4 cup) produces a less fluid dough that can be shaped prior to baking. The dough is handled gently and shaped into a ball while misting it with water to produce a smooth surface. A design can be created by scoring the surface with a sharp wet knife to a depth of approximately 1/4 inch. The crispy crust of sourdough bread is obtained by baking the loaf in a hot oven with plenty of moisture during the initial baking period. This can be accomplished by baking the moist dough in an enclosed space, such as a clay baking cloche , a cast iron Dutch oven , or by spraying some water on the dough when it is placed in the the hot oven and by keeping a shallow pan with water in the lower shelf of the oven to generate steam while the bread is baking. Controlling the moisture of the whole oven is more difficult than using a covered brick oven or cast iron Dutch oven. Since the dough is very moist, the shape of the Dutch oven determines the shape of the loaf. If the Dutch oven is too large and the dough does not fill it halfway, the loaf will bake flat. Thirty minutes before you plan to bake the bread, place the covered empty cast iron Dutch oven in the oven and preheat to 475°F (246°C). When ready to bake the bread, work quickly. Open the Dutch oven, sprinkle some bran in the bottom of the heated Dutch oven to keep the bread from burning and sticking. Transfer the dough to the Dutch oven. Make some decorative 1/2 inch (1 cm) deep slashes with a razor blade, if desired. Put the lid on the Dutch oven. Bake the covered dough for 30 minutes at 450°F. Remove the lid from the Dutch oven, and bake for another 15 minutes at to 400°F (204°C) until the crust is golden brown. Be careful not to get burned by the steam as you open the Dutch oven. Transfer the loaf to a wire rack to cool for at least one hour.